Have you ever imagined what it would be like to be Beast Boy? We think it would be pretty great! You could have the speed of a cheetah, with the strength of a gorilla. You could have the wings of a hawk, along with the quills of a prickly porcupine. You could even use your powers to transform into the ultra-powerful platypus! We're not really sure if transforming into a platypus is all that useful for crime-fighting, but you have to admit that it seems like a pretty awesome skill to have in your back pocket! You would also get to hang out with all of the other Teen Titans too! You could chill on the couch and play your favorite video games. You could have a hot dog eating contest with Cyborg (only tofu dogs for your, of course). You could tease Raven until you she smacks you around with her telekinesis powers and you could even help Starfire take Silkie for a walk (do moth larvae even takes walks?). 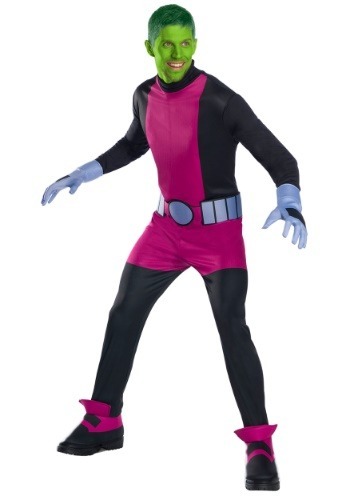 Well, if being Beast Boy sounds like a pretty good deal, then maybe it's time that you gave it a try by wearing this officially licensed Teen Titans costume for adults. This Beast Boy costume turns you into the superhero from the legendary Teen Titans series. It comes with a black jumpsuit that has the bright magenta front panel. It has a foam belt and a pair of attached boot covers. Pair that up with the gloves and you get a look that comes straight from the cartoon series. While you might not actually be able to transform into a platypus, this costume will help you feel like a real Teen Titan. Who knows, you might even be able to sneak your way into the Titan Tower when you're wearing this costume.